One Piece Treasure Cruise does one thing very right: it distills down the massive world of One Piece into a bite-sized experience that really feels like you’re a part of Luffy’s adventures. All of the major characters and events are represented faithfully with signature attacks and cutscenes taken straight from the anime. In this way it sets itself apart from other mobile dungeon battlers, giving players an actual story progression that closely follows the antics of the Straw Hat Pirates right from their origins and into the Grand Line. As a game however, it has some flaws in execution that can make the gameplay feel stale eventually, but it’s a mostly fun ride even if you aren’t familiar with the anime or manga. 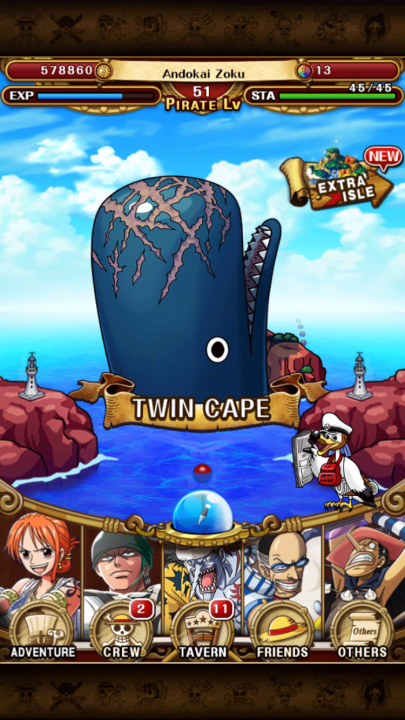 For fans of One Piece though, it’s definitely a must play. 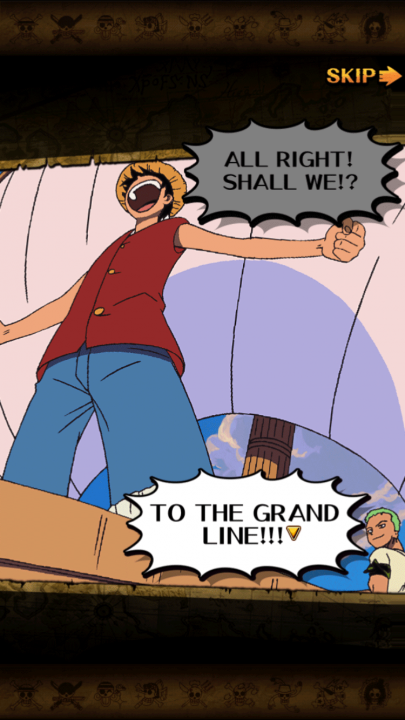 Right away One Piece Treasure Cruise throws you into Luffy’s world with a tutorial that mirrors the very first episode of the anime. You’re fighting alongside “Red-Haired” Shanks as he shows you how to perform combos and time chain attacks at the right moment for maximum damage. The battle system is quite similar to Brave Frontier, another mobile dungeon battler, in that you simply tap on a character to make them attack. 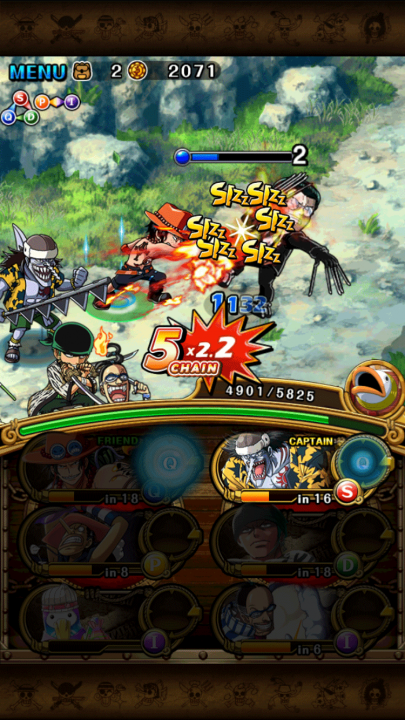 The twist that puts One Piece Treasure Cruise a level above is the impact timing, where getting a perfectly timed hit significantly increases damage. To further mix things up, each character can have slight differences in their attack timing and healing actually requires not getting a perfect hit. In addition, you often must switch up your attack order to maximize damage types versus different enemy teams. These changes make the game much more thoughtful and add an element of player skill to keep gameplay exciting. While exploring the world of Treasure Cruise early on, it’s immediately noticeable how much effort was put into recreating an authentic One Piece feel. 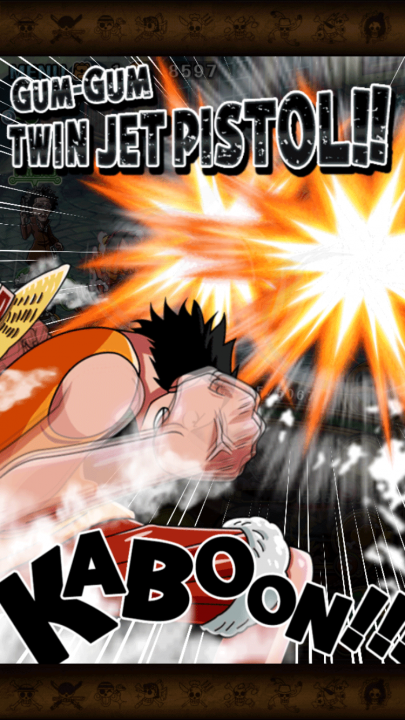 The characters’ attacks are based on their unique abilities, and the flashy special moves are complete with signature sound effects, poses, and catch phrases. 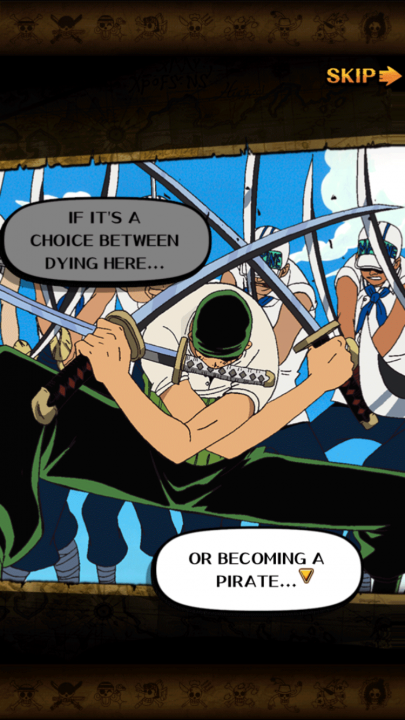 Where other dungeon battlers simply throw you into increasingly difficult fights, One Piece Treasure Cruise follows the anime’s storyline closely, even depicting stills from key moments. This adds a layer of immersion not typically seen in these types of games, where you just select a new area with different colored enemies and backgrounds. After getting past a few story islands and collecting several new crew members, One Piece Treasure Cruise opens up even more. It’s a generous game, doling out rewards and new things to discover at a good pace. Various special events are always available on any given day, some lasting even several days. These events give you the chance to recruit new characters and gain valuable materials for free without the need to spend premium currency. The best part is that unlike typical free-to-play games, events aren’t restricted to short one hour blocks of time. You can play an event at any time of the day, removing the compulsion to play the game on a schedule. You can make your own time to shoot for the items you want. Outside of these events, the game gives you many chances to get upgrades for your crew. You can obtain new characters by spending premium currency, but you don’t even need to for many characters, even iconic ones like Smoker and Arlong. It’s possible to recruit almost all of the story characters by fighting them as bosses, then hopefully having them drop as an item. You can also reasonably expect to max level and evolve most mid-tier characters within a week of play. In general, the game doesn’t feel too much like a grind at this point. It’s easy to progress through the story at a reasonable pace as long as the proper captain ability and crew members are selected. Referring back to the element of player skill, a smartly used Level 1 4-star character can still be useful with well-executed attack timings. You don’t need to have a fully evolved monster team of 5-star Ultra Rares to keep advancing the story. It rarely feels like there is an artificial wall that forces progress to stop, and it’s fun to see where Luffy’s adventures take him next without worrying about the grind. Unfortunately, One Piece Treasure Cruise hits a lull period after completing most of the story islands. Without the story as an incentive, you’ll likely only play to slowly rank up your best characters to 5-star status, which is an arduous process. Evolving even one 5-star character requires a massive amount of beli (in-game currency) and XP materials along with some rare drops that only show up on certain days. Thankfully these resources are provided at a decent rate, it just takes a long time of battling the same set of stages which gets repetitive. Finally getting to the payoff is very rewarding though, as most 5-star characters have stats and special abilities that can completely shuffle your crew-building strategy. Another small motivation to play during this time is increasing your Pirate Level, slowly granting you more stamina and crew cost. This lets you play high level content more often and allows you to form a crew using the most powerful members of your roster. Adding that one extra powerhouse to your team can really make a difference in clearing stages quickly and smoothly, and opens up some new team strategies to experiment with. 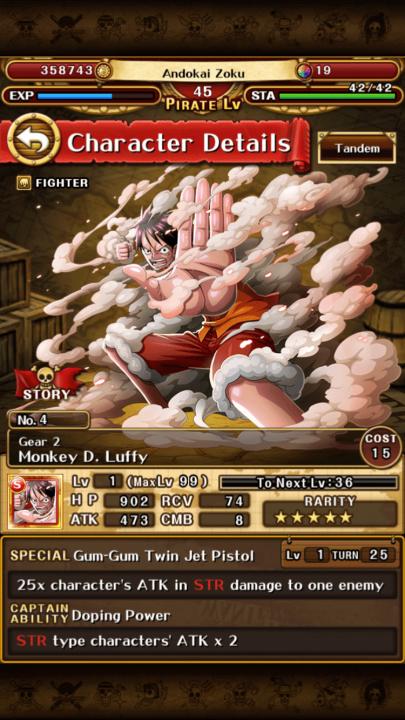 Overall, One Piece Treasure Cruise is a game that benefits from its faithfulness to the One Piece world at the cost of some gameplay excitement. It’s amazing fun to step into the Straw Hat Pirate’s shoes and live out their best battles with a dream team crew you’ve recruited and trained. However, because the story is the best part of the experience, the game’s underlying systems are revealed to be somewhat repetitive once you’ve mastered them. There’s not much more to see once you’ve memorized all of the attack timings, enemy patterns, and upgrade material locations. A little randomness in how battles play out could have helped to keep things fresh. But the game does regularly add new islands to explore and characters to recruit and defeat, making things fun again with each new content patch. For most One Piece fans, this will be more than enough to keep One Piece Treasure Cruise installed on their mobile device for a long time to come.